I started out at 630 on my very first CAT exam. In my eyes, I had performed very poorly and I knew that I had a huge mountain to climb before I could reach my target score. Over the course of my study, I eventually broke my target score of 720 and landed well above it at 750. Below is a chart detailing my CAT scores over time along with a listing of each exam. Each time interval represents 2 weeks, so if you add up all the segments, I studied for approximately 15 weeks before the test. If you’re about to begin your GMAT study, or are right in the heart of it, there are definitely a number of things you can learn from my experience. Do not always expect a score increase after each practice exam. If you look between CAT 2 and CAT 4, between August 15th and September 27th, you’ll notice that my score remained relatively flat despite 6 weeks of hard studying. This caused me a great amount of emotional grief (I blogged noticeably less during this period) and probably represented the greatest test of my will. Initially, I had been very pleased after having scored so high on my second CAT exam. I had broken 700 and I hadn’t even learned about combinatorics or overlapping sets yet. But the in the three subsequent CAT tests I could not raise my score. This really depressed me and made me question the value of my studying. But even though my score wasn’t improving, I knew I was learning new material every week because the questions I was getting wrong came from different subjects. This just proves that you shouldn’t anchor too heavily on what your CAT scores may be during the middle of your studying. Instead focus on learning new content and refining your approach to each question type. Give yourself time to study after the course ends. I know many people from my MGMAT class that took the test a week after the course ended. Many of those people ended up having to retake the test. It’s difficult to finish all the homework from a GMAT course all within 9 weeks. If you really wanted to join the “one and done” club, I would recommend giving yourself ample time after your course to review. In my case, I took approximately one month to do intensive study after my course ended. Don’t Save Your GMAT Prep Tests for the End. People realize that the GMAT Prep software is the best simulation of the actual GMAT, so they have a tendency to save these tests towards the end. The problem with this strategy is that CAT exams from test prep companies are insufficient in replicating the GMAT. 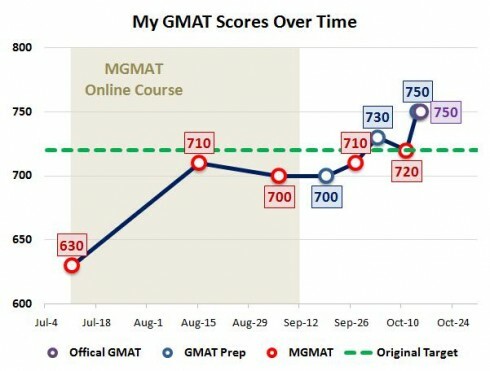 When I took my first GMAT Prep test, I was shocked at how different the math was when compared to Manhattan GMAT’s CAT exams. MGMAT usually does a great job of simulating GMAT problems, but this is not the case for 700+ level questions. If I had only relied on my MGMAT CATs to benchmark myself, I would have been really surprised during test day. For your studying, I would recommend actually starting with one of the GMAT Preps, and then doing the remainder over the course of your studies, with the intent of retaking both exams at least once. Retake the GMAT Prep Tests. I really don’t understand why more people don’t advocate retaking the GMAT Prep CATs. Many people think that “retaking” a CAT means you will get a ton of the exact same problems. When I retook GMAT Prep CAT 1, I only saw 4 repeat questions in total, 2 of which I got wrong. Retaking exams is a great way to learn new material and potentially refresh material you didn’t learn the first time. Complete a lot of Practice CATs towards G-Day. This is probably obvious advice, but definitely worth repeating. Taking a lot of practice CATs toward the end of my studies helped me acclimate to the four hour test. Before some of my earlier CATs, I’d always be nervous before starting the exam. By my last week of studying, the CAT exam felt like second nature to me. I also built endurance and didn’t feel fatigue towards the end of the test. Don’t study for more than 4 months. If you look at my study schedule, you can see that I studied for approximately three and a half months for the test. Toward the end, I realized I was starting to forget material and had to work really hard to refresh it. Success on the GMAT is about studying hard; just studying for a long period of time won’t get you very far. If you have an extended study plan ranging from 6 months to a year, you likely won’t retain everything on test day. The Composite Score Algorithm is a black box. Looking at my last practice CAT and the actual GMAT, I’m not oblivious to the fact that my Verbal score was a full two points higher on the actual exam, yet my composite score was exactly the same between the two. Having read through many forums, I know that trying to decipher or contest the score split to composite score algorithm is a dead end. At the end of the day, I’m happy with my score and the splits that made them up. Study the last day before the test. This is something that people definitely do not agree on. Some people will tell you to take the day off the day before the test. They believe that it’s more important to be completely relaxed before the big day than it is to cram. For me, the stress of the upcoming test forced me to study harder because studying was a stress reliever for me. If I hadn’t studied up until the last minute, I wouldn’t have walked into the test center with as much confidence as I did. I would recommend that you adjust your strategy based on your prior test-taking habits. For me, I had always studied hard right before finals during college and this typically worked well for me. Manage stress during the last week. Just trying to keep a positive mindset is not enough to keep your stress levels down. You’re about to take what is likely the biggest standardized test of your life – personal will probably won’t be enough. You need to expect to face the worst stress of your life and be ready to combat it. Some things that worked well for me included ramping up my workout schedule and getting massages for my sore back. I was definitely suffering from insomnia during the last few weeks, so to help me fall asleep at night I took Unisom sleep gels, which are essentially a higher dose of Benadryl. Refine your processes. The three question types that are process oriented, in my opinion, are Critical Reasoning, Reading Comprehension, and Data Sufficiency. During my last few weeks of study I made sure I completed every practice problem with the approach that I had set out, making it a priority to do every problem the exact same way. In my opinion, whether or not you get these questions right during practice is almost irrelevant – the adcoms won’t see your practice scores. But going into test day with a refined process in your head, one that you could do in your sleep, is the key to success on these question types.